The answer to that question lies with the Chrotchtangle Regional’s 13-seed and the Prince of Packaging himself, Dermot Smurfit. Over the course of a career that started when he was 17, this septuagenarian Irishman, die-hard Patriots fan, and Corrugated Commodore worked under his father and alongside his brothers to help build Smurfit Kappa, Europe’s top corrugated packaging company. According to its website, Smurfit Kappa manufactures over 10.8 billion square meters of corrugated packaging per year, owns roughly 103,000 hectares of forest around the world, and employs 45,000 employees across 33 countries. That’s a lot of boxes. And you’d better believe Smurfit is making that paper in more ways than one: in 2016, the Captain of Cardboard’s fortune was estimated at a cool €90mm ($101mm) according to this article from the Independent. Now that he’s semi-retired, he’s been able to pursue some “outside-the-box” activities, like supporting the fantastically-named Crumlin Children’s Hospital. But Smurfit’s road out of the Chrotchtangle and into the annals of NOTY history won’t be as simple as running a multi-billion dollar corrugated conglomerate. And while it helps to have a name that fits perfectly as a Bop-It command, he’s up against the 4-seed Alprentice Vonslatten, a towering name in its own right. Elsewhere in the bracket, the competition is no less fierce. Can Shaky Sherpa navigate a steep climb to the top of the bracket, or will Steele Fortress keep it safely locked down? Will Chastity Gooch-Fant deflower her adversary, or can Mustafa Tuna swallow her hook, line, and sinker? Finally, can Telisport Putsavage put the hurt on l’opponent, Joe L’Official? For answers to these questions and many more, follow along on Twitter and make your voice heard by voting below. 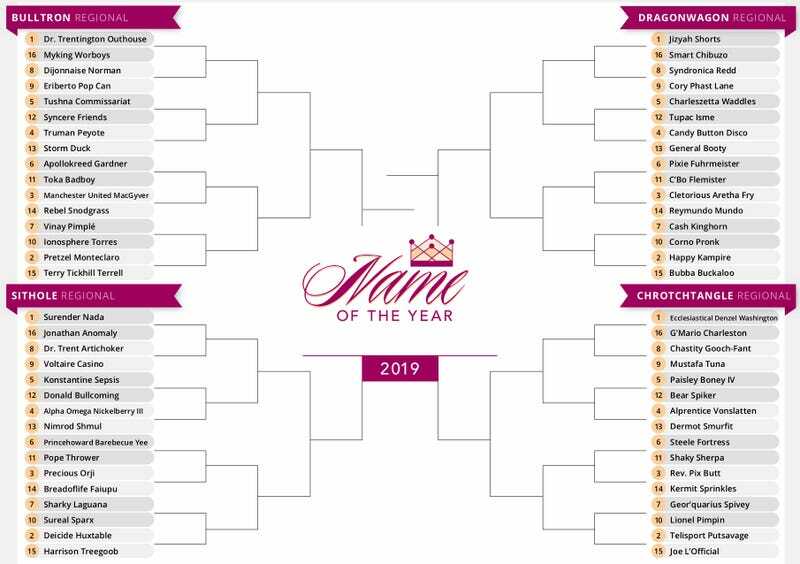 And as always, the bracket is sourced from our dedicated fans, so drop us a line at nameoftheyear@gmail.com if you think you’re sitting on the next name champion. Happy voting!